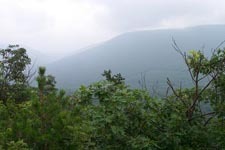 Description: This is a moderate 7.8 mile shuttle hike in the GWNF on the VA/WV border. I’ve given it this name to lessen confusion with a circuit hike that utilizes the south west segment of this same ridge and the same Vance’s Cove Tr used here except you follow it upstream. Here you proceed downstream to finish the hike. 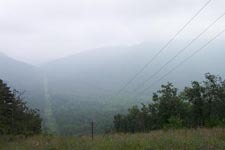 The trek features an initial 400 ft climb over the first mile and then rolling hills followed by a deep descent to the bottom of the cove and a nice walk along Paddy Run, crossing it three times, as you return to your cars. Note: In order to hike this shuttle as described the front gate on FR93 has to be open to vehicular traffic. Call the Lee Ranger District of the GWNF to find out open dates. If the gate is closed and you still want to do the shuttle add 2.3 miles of forest road walking to the hike. FR93 (Paddy Run Lane on the Google Map) is not signed and very hard to find. 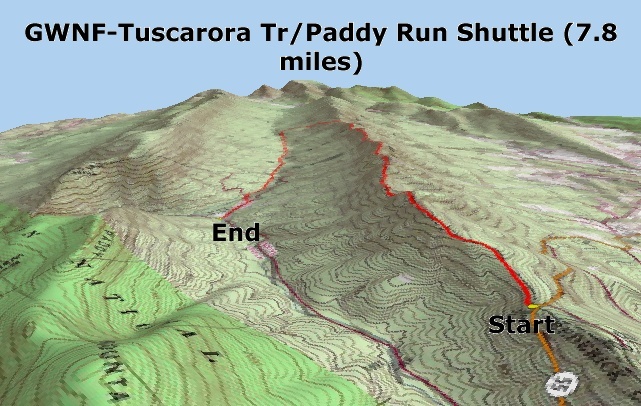 The Tuscarora Trail is part of the Great Eastern Trail (GET). Trail Notes: From Rt55 walk southwest on the blue blazed Tuscarora Trail. The trail will be rocky and steep in places. Climb 500 feet in the first mile. At about 1.9 miles cross over a power line swath and begin partial views of Vance’s Cove. You other cars are somewhere down there. From here the tread will vary from rocky to grassy to a smooth carpet of pine needles and back again. In another 2.0 miles arrive at the Gerhard Shelter. This is a nice place to take a break before the steep descent to the cove. 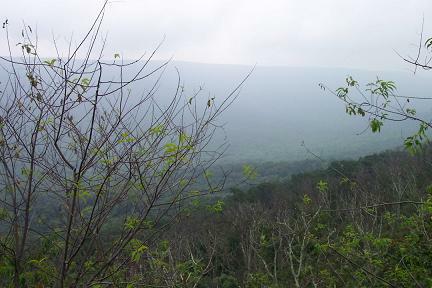 From here as you face southeast along the ridge turn left down white blazed Gerhard Shelter Trail with a sign pointing to a spring. 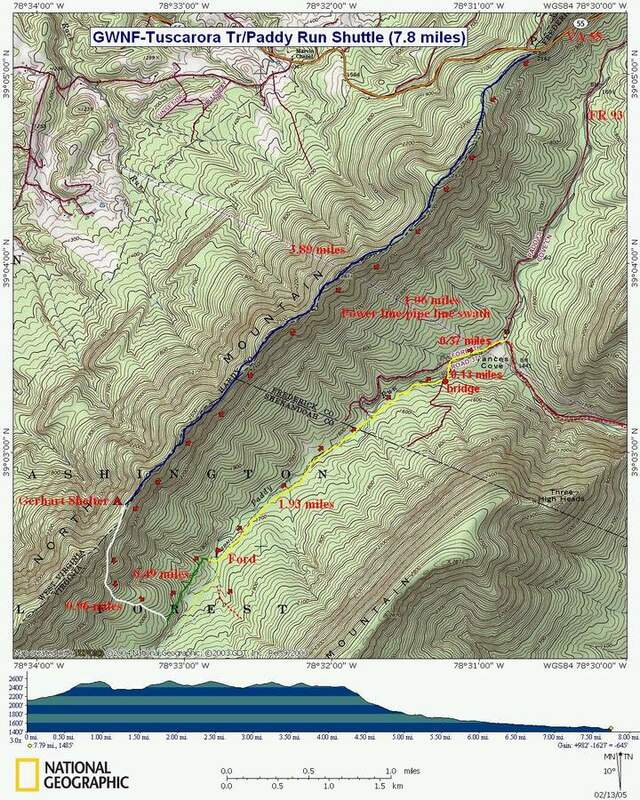 Descend for 0.94 miles, crab-walking at times as you drop 750 feet in elevation, until you reach gravel FR 93. Turn left on FR 93 and walk about 0.5 miles past a locked gate. Turn right onto a woods road that soon passes a campsite and ends at Paddy Run. Cross Paddy Run and turn left onto yellow blazed Vance’s Cove Trail. Follow it for 1.93 miles, crossing the stream two more times before arriving at a low water concrete bridge. Turn left and cross the bridge, following the dirt road to the intersection with FR 93. Turn right onto FR 93 and in 0.4 miles arrive at your cars at the fork in the forest road. If you feel the need to walk a little more follow the other branch of the forest road down to the east branch of Paddy Run. Cross it and follow a forest road into Paddy Gap. 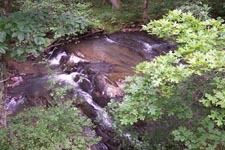 You’ll find more rocks, white water and Hemlocks here. This trail actually goes all the way through the gap, crosses through private property and ends at County Road 600. If you walk the entire stretch you’ll add about 2 miles in both directions to the day’s hiking. I’m currently studying the feasibility of adding this extra two miles to the current shuttle, starting as shown here but ending on County Road 600. I’ve been told that the land owners let fishermen use the trails along the run but this has to be confirmed.